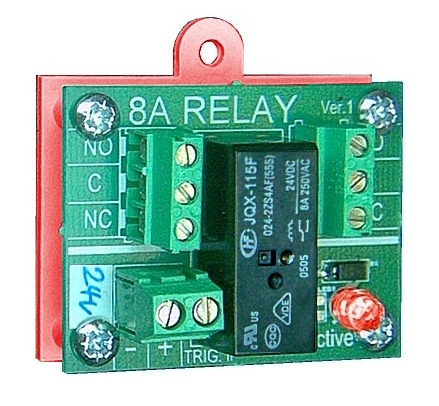 The Easy Relay 24 is a fire systems relay with a 24V coil intended to be used in an array of 24V DC applications such as fire system interfacing. 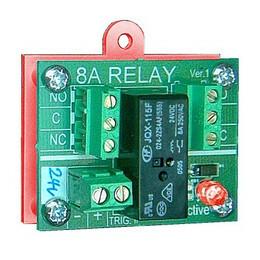 The relay allows easy connection to bell circuits using EOL resistors due to a built in diode in series with the coil and has two sets of contacts, both made from silver alloy, that are capable of switching 8A. An LED is built in to the unit to provide fast indication that the contacts are in the active position. This compact power type relay can achieve up to 100,000 operations in its lifetime if used correctly. It's important to ensure that the latest IEEE electrical wiring practices are adhered to when mounting the Easy Relay 24, especially if mains voltages are being switched.